Jakarta. The flash flood in Sentani, Papua, which has killed at least 100 people since Saturday (16/03) has been years in the making, experts said, with Papua's unique mountainous terrain and a recent weather anomaly combining to a disastrous effect. Sentani is crisscrossed by several rivers that carry water from Cyclops Mountain north of the city to Sentani Lake, the largest lake in Papua. The city is no stranger to floods as the water level on the lake always rises during the rainy season. But the city has not experienced a flash flood like the one on Saturday since 2007. The Environment and Forestry Ministry said on Tuesday the flood was mainly the result of accumulated natural distress on the steep slopes of Cyclops Mountain. It also said that deforestation was unlikely to be the cause of the flash flood. "We believe what happened was a landslide. Natural dams were formed [on the mountain slopes] years ago, then on March 16, after a seven-hour heavy rainfall, those dams burst. The flood swept stones, timbers and other debris through the city," I.B Putera Parthama, the director general of watershed management at the ministry said in a press conference. Putera also pointed out that the slopes of Cyclops Mountain are very steep and largely constituted of water-resistant metamorphic soil which make them prone to landslides. "The trees [swept by the floods] still had their twigs and roots attached. They were not timbers from logging activities," he said. The Meteorology, Climatology and Geophysical Agency (BMKG) has already warned that an anomalous weather pattern known as the Madden-Julian Oscillation, marked by heavy clouds and rainfall, strong winds and high air pressure moving eastward along the tropics, would result in higher than normal rainfall across the Indonesian archipelago this month. Putera said according to the ministry's data, 495 hectares of mountainous land, or 3.3 percent of its total area, were converted from forest land into agricultural or residential areas between 2012 and 2017. He said in the catchment area, there were settlements and dry farms managed by local communities, which totaled ​​2,415 hectares over the same period. "There is not strong enough evidence to associate this incident with changes in the forest cover," Putera said. The flash flood in Sentani could bring the total number of fatalities from floods across the country this year to more than 200—the deadliest year since 2017. Last year, floods killed 119 people and displaced more than 1.5 million in Indonesia. 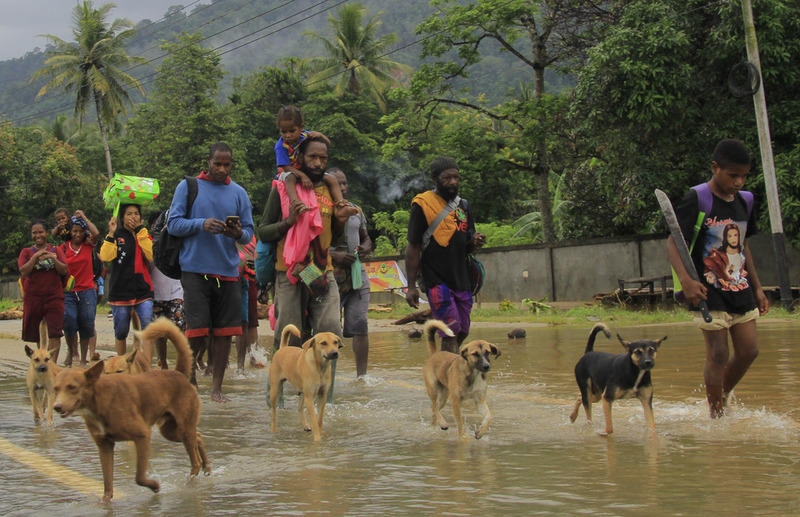 Thousands of Sentani residents are opting to stay at makeshift sheltels around town on Tuesday, fearing that the deadly flash flood may return as heavy rain keeps pouring down. It has rained non-stop in Sentani for almost 13 hours since Monday night, and water level continued to rise in many spots, including in villages around Sentani Lake. Search and rescue teams have been working around the clock to rescue victims and clear up flood debris, which are mostly made up of boulders and trees. So far 100 dead bodies have been recovered. At least 74 people are still missing. "We fear more floods might be coming. We're still on edge," said Erdina Mandoen Kafiar, a Sentani resident who has been staying at one of the city's flood shelters since Saturday. A total of 8,773—or one in 13 Sentani residents—have been evacuated to flood shelters, according to Col. Inf. Muhammad Aidi, a spokesman from the Cenderawasih XVII regional military command, whose soldiers have been helping out with the rescue mission.